First unveiled in 2013 by President Xi Jinping, China’s Belt and Road Initiative (BRI) is expected to bring many benefits to ASEAN as increased Chinese capital flows through infrastructure projects spanning ports, roads, railways and energy sectors. Xi has pledged US$124 billion to finance projects under the initiative. Singapore, being a member state of ASEAN, has significant roles to play in BRI through its status as a financial hub for China and Southeast Asia. In addition, the city-state has established industries with the experience and expertise to drive and support infrastructure development for BRI in ASEAN. Apart from obvious beneficiaries such as EC World REIT and Yangzijiang Shipbuilding, there are at least 6 other small- to mid-cap SGX firms that have cited BRI as a growth impetus in their most recent annual reports. They are: Frasers Logistics and Industrial Trust, Tai Sin Electric, Vibrant Group, Hong Lai Huat, ASL Marine and Addvalue Technologies. First unveiled in 2013 by President Xi Jinping, China’s Belt and Road Initiative (BRI) refers to China’s Silk Road Economic Belt and 21st Century Maritime Silk Road development strategy, focusing on connectivity and economic co-operation across Asia, Africa and Europe. 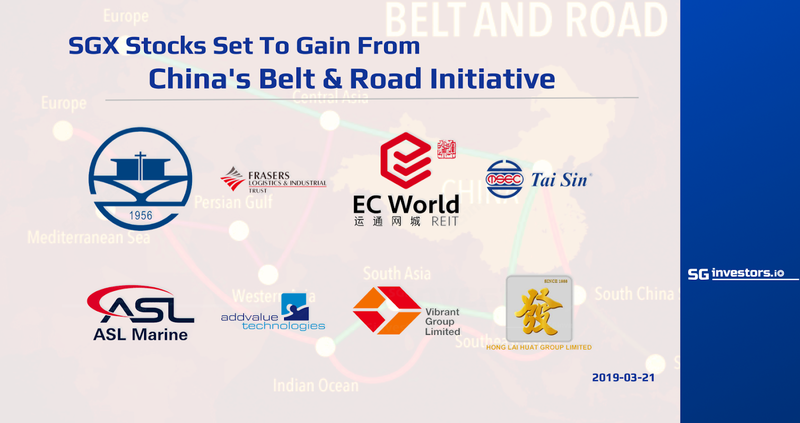 The BRI is expected to bring many benefits to ASEAN due to increased Chinese capital flows through infrastructure projects spanning ports, roads, railways and energy sectors. Xi has pledged US$124 billion (S$174 billion) to finance projects under the initiative, which is an ambitious strategy by the world's second-largest economy to boost its investments, influence and trade connections globally. A 2017 report by RHB Securities stated that ASEAN will likely become the bridgehead for BRI due to the region’s geographical proximity and relatively low risk profile. Apart from infrastructure investments, BRI could also impact other sectors in the region, primarily industrials, materials, and utilities, and indirectly, finance, consumer, healthcare and tourism. Infrastructure development and improvements – A United Nations Conference on Trade and Development’s (UNCTAD) report estimates that ASEAN needs infrastructure investments of US$60 billion-US$146 billion a year between 2015 and 2025. ASEAN members are expected to see more joint infrastructure development across the region, such as the Sino-Laos and Sino-Thai railway projects. Increased trade and regional connectivity – According to the Chinese Ministry of Commerce, trade between China and countries along BRI are projected to be worth over US$2.5 trillion by 2025 and beyond. Singapore, being a member state of ASEAN, has significant roles to play in BRI through its status as a financial hub for China and Southeast Asia. In addition, the city-state has established industries with the experience and expertise to drive and support infrastructure development for BRI in ASEAN, within sectors such as industrials, materials and utilities. Apart from obvious beneficiaries such as EC World REIT, which owns assets used primarily for e-commerce, supply-chain management and logistics purposes, and Yangzijiang Shipbuilding, which focuses on vessel construction and offshore engineering, there are at least 6 other small- to mid-cap firms on SGX that have cited BRI as a growth impetus in their most recent annual reports. Frasers Logistics Trust owns 21 prime and predominantly freehold industrial properties located in key global logistics hubs in Europe. The properties are situated across seven major logistics clusters: Leipzig-Chemnitz, Munich-Nuremberg, Stuttgart-Mannheim, Dusseldorf-Cologne and Hamburg-Bremen in Germany, as well as Tilburg-Venlo and Utrecht-Zeewolde in the Netherlands. In its 2018 annual report, FLT noted that Tilburg-Venlo – the Netherlands' sixth largest city and largest inland logistics hub – is a key city in BRI, given its direct connection to China via the Chengdu-Europe Express Rail. Venlo is the main logistics hotspot of the Netherlands due to its strategic location between the Randstad, Flemish and Ruhr regions. Rapid growth of transport infrastructure, in combination with relatively low rents, makes the region an attractive location for the distribution sector. Tai Sin Electric is a regional electric solutions specialist that manufactures cables, switchboards and lamps, and operates a regional network distributing electrical and control products, devices and accessories. In its 2018 annual report, Tai Sin pointed to the International Monetary Fund’s (IMF) view on BRI, noting that the agency believes both the Comprehensive and Progressive Agreement for Trans-Pacific Partnership (CPTPP) and implementation of BRI could support trade, investment, and growth in the ASEAN economies. In light of this, the Group will remain steadfast in expanding and nurturing its markets in the region, including the newer ones such as Myanmar, Cambodia and the Philippines. “We will introduce new innovation and technology to help us establish a strong market presence across different business sectors and achieve profitable traction,” it added. Formerly known as Freight Links Express Holdings, the company has rebranded itself as Vibrant Group Ltd in 2013. Apart from offering integrated state-of-the-art logistics solutions, it also provides building construction services as well as real estate fund and property management services to Sabana Shari’ah Compliant REIT. In its 2018 annual report, Vibrant noted that the Group has moved “decisively” to capture the growth opportunities arising from BRI. As a result, despite challenging market conditions, the performance of its Freight and Logistics business continued to improve over the year. In particular, Vibrant has expanded its existing logistics network by entering into a strategic partnership with The CCI Eurasia Land Bridge Logistics Development Co Ltd, providing warehousing and transhipment solutions for the Chongqing-based global logistics player in Singapore. It also deepened connectivity in the Chongqing logistics hub with construction of a Multi-Modal Logistics Distribution Centre at Yufu Industrial Park. Established since 1998, Hong Lai Huat has completed numerous projects in Singapore, ranging from public and private residential developments, to commercial and industrial buildings. In its 2017 annual report, the property developer noted that its D’Seaview development in Sihanoukville, Cambodia, continued to achieve strong sales momentum during the year, with more than 80% of the commercial units and 60% of the residential units sold to-date. Sihanoukville, located at the tip of an elevated peninsula in the country’s southwest coast, is one of the most popular tourism destinations in Cambodia, and a city touted as the first port-of-call for China’s BRI. This has since attracted many international investors to invest in Sihanoukville, the company added. ASL Marine owns and operates three shipyards in Singapore, Indonesia and China. It has a strong focus in shipbuilding, ship repair, ship conversion, ship chartering and other marine-related services, catering to customers mainly from Asia Pacific, South Asia, the Middle East, and Europe. In its 2018 annual report, ASL Marine noted that infrastructure spending in selected Asian markets is expected to increase further, as China implements BRI in countries along the route. The urbanisation process in emerging markets such as the Philippines and Indonesia should also boost spending for vital infrastructure such as water, power and transportation, which represents mid- to long-term opportunities for the Group’s non-offshore and marine businesses. As a “one-stop shop” communications technology products developer, Addvalue provides state-of-the-art, satellite-based communications and other innovative digital broadband products and solutions. In its 2018 annual report, the Group said it would continue to ride on opportunities from BRI in the China market. Through its China subsidiary, Zhongxin Chuangzhi (Beijing) Technologies Ltd Co, it continued to expand its Chinese partnerships into the small fishing fleets and maritime markets. It is also exploring deeper and strategic partnerships to participate in Chinese indigenous programs, such as the new S-band mobile satellite system and the next-generation Beidou navigation system. The table below details the 6 SGX-listed companies that have cited impact from China’s Belt Road Initiative in their most recent annual reports, sorted by market capitalisation. Among these 6 stocks, the 3 best performers in the 2019 YTD were: ASL Marine (+20.3%), Frasers Logistics & Industrial Trust (+11.7%), and Hong Lai Huat Group (+9.1%). The trio averaged a total return of 13.7% over the period.